Meaza Ashenafi named Ethiopia’s first woman Supreme Court President. Ethiopia is certainly leading the way in terms of gender parity and inclusivity. The dust has hardly settled since the recent appointment of a new Cabinet that is half female and the first female president. Ethiopia has followed that up with the unanimous endorsement by parliament of prominent women rights defender, Meaza Ashenafi as the first woman Federal Supreme Court President. Ethiopia's parliament has unanimously endorsed prominent women rights defender, Meaza Ashenafi as the first woman Federal Supreme Court President. Fitsum Arega, Chief of Staff, in the Prime Minister's Office, confirmed the development. Prime Minister, Abiy Ahmed nominated Ashenafi for the post, which is one of the most powerful positions in the country. Arega, posted on Twitter: "HE PM Abiy Ahmed nominated Meaza Ashenafi as the first woman Federal Supreme Court President. Ethiopian Parliament has unanimously endorsed the nominee. Ethiopia's march towards gender parity in key leadership positions continues unabatedly. Congratulations! #Ethiopia"
"Meaza Ashenafi is one of #Ethiopia's most seasoned lawyers and a prominent women rights activist. She was the founder of Ethiopian Women Lawyers Association and has served as High Court Judge. She brings a track record of competence and relevant experience to the role," Arega added on Twitter. The news of Ashenafi's appointment, and endorsement is being celebrated by many across the continent on social media. Ashenafi (54), a prominent women rights defender, has an illustrious career. She has served as a Judge of the High Court of Ethiopia between 1989 and 1992. In 1993 she was appointed by the Ethiopian Constitution Commission as a legal adviser. In 1995, Ashenafi founded the Ethiopian Women Lawyers Association (EWLA), and became its executive director. Through her legal contacts, she has been instrumental in campaigning for women's rights in Ethiopia; her Fighting For Women's Rights In Ethiopia group had approximately 45 graduate lawyers working for it in 2002. Ashenafi has held a position with the United Nations Economic Commission for Africa. 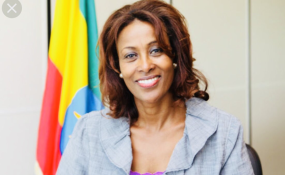 She helped lead the development of the first women's bank in Ethiopia, Enat Bank, which was established in 2011 and as of 2016 chairs its board of directors. She has won numerous awards in recognition of her work. Since April 2018, when he came to power, Prime Minister Ahmed has implemented a number of radical reforms, which have been widely applauded. Amongst these changes is lifting of the state of emergency, Ahmed also ordered the release of thousands of prisoners, allowed dissidents to return home, unblocked hundreds of websites and TV channels and relinquished a long disputed border territory that ended the war between Ethiopia and Eritrea. His government also announced an unprecedented gender balanced cabinet recently, appointing 10 women to ministerial positions. The move was hailed across the world, welcomed as a progressive move. The prime minister told parliament on the occasion: "Our women ministers will disprove the adage that women can't lead. This decision is the first in the history of Ethiopia and probably in Africa,"
"The main problem in this country is the lack of peace. This [peace] ministry will be working hard to ensure it prevails," he added. The new Cabinet continues to be celebrated not only because of it gender equity but because it is also more representative of the marginalised ethnic groups of the country - which is home to more than 80 ethnicities. Last week, the country's parliament appointed the first women president, Sahle-Work Zewde - who has worked as United Nations representative in African Union. President Zewde (68), has also worked in Ethiopia's Foreign Service for decades. She also served as Ambassador to Senegal, with accreditation to Mali, Cape Verde, Guinea-Bissau, Gambia and Guinea, from 1989 to 1993.